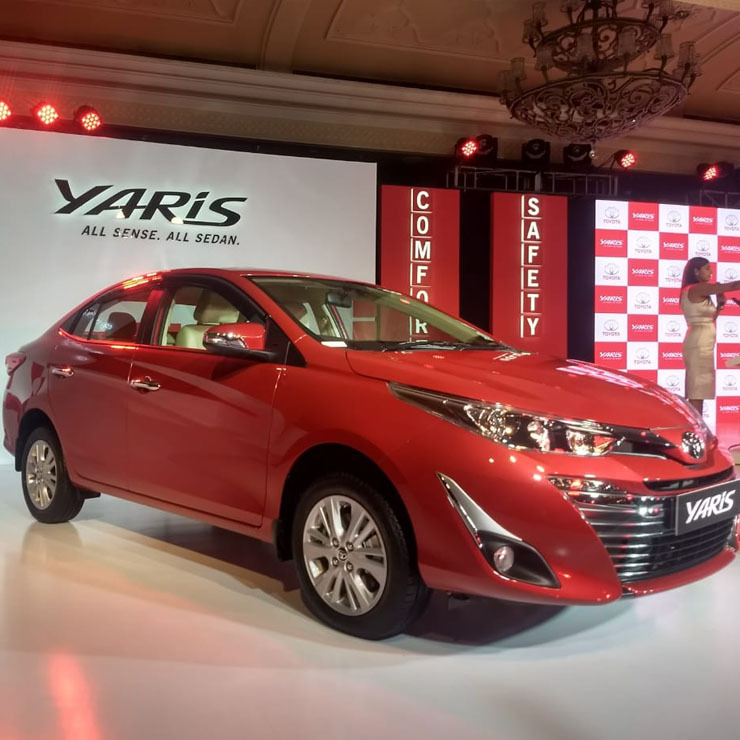 The recently launched Toyota Yaris C-Segment sedan is off to a good start in India, what with Toyota already shipping 4,000 units of the car to dealerships across the country. Launched at an introductory price of Rs. 8.75 lakhs, the Yaris competes with the likes of the Maruti Suzuki Ciaz, the Honda City and the Hyundai Verna. The car is a petrol-only offering in a segment where almost every other car offers both petrol and diesel engine options. The Yaris is sold with manual and CVT automatic gearboxes. The engine is a 1.5 litre, 4 cylinder naturally aspirated unit with 108 PS and 140 Nm outputs. The Yaris is feature-rich, and is easily the most safety packed car in its segment. 7 airbags are standard across the range, along with ABS+EBD. Other safety features on offer include front proximity sensors, disc brakes on all four wheels, reverse parking sensors, reverse parking camera, ESP, hill hold assist on the automatic variants, and cruise control. As for creature comforts, the Yaris comes with roof mounted AC vents for the rear seat passengers, ambient lighting, a power adjustable driver’s seat, a touchscreen infotainment unit with gesture control, ambient lighting, and infrared resistant factory-tinted windows. If the Yaris manages to do over 3,000 monthly units in a highly competitive segment, Toyota would be quite happy. This is because the Yaris doesn’t have a diesel engine, even as an option. Fuel prices in India are rising, which makes a diesel engine option quite important. This is because diesel is not only cheaper than petrol in India, but also the diesel engines are a lot more fuel efficient than the ones that run on petrol. Toyota has clearly stated that it wouldn’t be offering a diesel engine in the Yaris even in the future. It remains to be seen how Toyota’s petrol-only bet plays out in the future.